Remember how you use to have surveyors all over the place staking and providing all grading stakes during the earthwork process? Technology has provided for a more simple, easiest and possibly safer solution by installing GPS grading devices to all types of heavy equipment. There are multiple options that you can use to install GPS grading control system to your equipment depending on the needs and complexity of your project. Let's take a look at some of the most common alternatives. In order to be successful in the earth moving industry you really need one of these GPS grading systems installed and fully function in your equipment. These systems also called as Machine control systems can be extremely beneficial during the earthwork process reducing the needs of additional staking process. There are some other benefits and they will be summarized later on. 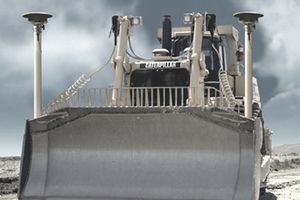 There are different manufacturers available and this equipment can be installed in almost all types of dozers, excavators, graders and even skid steer loaders. GPS grading systems are installed at your heavy equipment making the cut and fill process 10 times more efficient than actual staking process with traditional surveyors, even when they are GPS equipped. Some of these GPS tools can have a display installed at the operators cabin so they can have the actual information on how much they will need to cut or fill in relation to the position on which they are in the field. Now, its easier as the operator will now what will be the final grade on any specific point within the project site. This equipment can be installed with GPS sensors at the blade position so the operator will know how much cut or fill is needed with real time data. The blade will be auto-positioned as the final grade approaches reducing the needs of extra work. The on-board computer analyzes the design elevation to calculate the needs to cut or fill, and presenting the operator with visual aids on how to position the blade for better accuracy. Final grading is very accurate, but this will largely depend on the manufacturer's equipment accuracy and the information entered into the system. No need to stake several time, when huge lifts are needed on in areas with large cut volumes. Reduces the amount of staking required on site and almost eliminates the waiting time for operators to start working before staking is completed. No stakes to run over, eliminating the cost of stake replacement. Eliminates the need to having a surveyor in muddy places or areas that are heavily wooded. It is safer as it also reduces the needs of having workers standing near heavy equipment. Earthwork estimates can now be more competitive due to reduce working time and resources needed to complete the work.